Please Note: If you’re suffering from Eating Disorder, then it’s important to consult with your Doctor, healthcare provider, nutritionist or your treatment team, before you proceed with any eating program. This is to ensure that your nutritional intake during Ramadan is adequate. Please take appropriate guidance from your health care provider and put it into practice during the month of Ramadan. 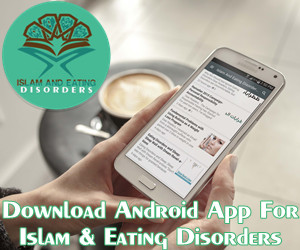 Dear Readers, I promised a reader that I will do a post on how to eat mindfully during Ramadan and some tips on how to avoid/stop binge eating. With the Ramadan season upon us, food is everywhere. This is sad and truly sad, because Ramadan is about worshiping Allah, purifying your soul, being charitable, sacrificing your ego and exercising moderation. From lavish Iftar parties to buffet dining at Restaurants to extravagant dinners with friends and family, let’s face it, Ramadan has come to center so much around food. To stop/lessen the cycle of binge eating/over eating and to be normal and in control around the food. To take charge and make decisions about what and how much to eat and when to stop. To aim for healthy balanced relationship with the food. Bear in Mind Ramadan is not about looking like a super-slim runway model. It’s not about being an unhealthy and unnatural weight. It’s more to do with your overall well-being, cleansing your heart, mind, spirit and improving your emotional spiritual outlook. You’re blessed to be given a month which meets your emotional needs so that you don’t meet it through food. Eating Mindfully in Ramadan- there’s an element of beauty and blessing in this, because when we make our niyah/intention to fast for Allah, to eat for Allah, to ignore the demands of the demon of Eating Disorder and to go beyond the diet and the weight loss- one will Inshallah find the key to transform their relationship with food. The Prophet (PBUH) said: “Break your fast by eating dates as it is purifying.” (Narrated by Ahmad) It’s Sunnah to have odd number of dates, 1 or 3. Prophet Muhammad (pbuh) used to have 3 dates with a glass of milk. Always Break Your Fast with a Date and a Glass of Water with a slice of Lime- This eases digestion and cleanses the system. Benefits: This cleanses your stomach and acts as a mild diuretic. Water boosts your immune system. Lemons are high in vitamin C and potassium.This also energizes your metabolism. Do not Make this Mistake- Ramadan is about eating in moderation and eating well balanced meals. Some people think it’s smart to fill oneself up with low-calorie drinks, dense calorie foods and salads. Overeating is overeating, whether your binging on chocolate or celery sticks. One rule of Islam= Eat in Moderation and do Not fill your stomach. Simply replacing overeating fried food/chocolates/cakes with overeating salads/fruits/soups is not the answer. We’re not used to focusing on simply eating in our society. It’s crazy actually at the Iftar Table. We look forward to opening our Fast, but then we rush right through the meal without really tasting or savoring the food. These tips are quick and simple ideas to incorporate a new healthy behavior to try during Ramadan and after Ramadan. Don’t Forget, Small Steps can lead to Big Changes. Slow down. As soon as people break their fast, there’s a mad rush/frenzy around buffet table, the food is usually piled high on most everyone’s plate. You wolf down the first plate and pick out more of your favorites to gobble down as second helpings. Scan the Buffet/Serving Table before you Dive in- Eat, what you want, think before putting food on your plate. If you just grab your plate and go, it’s likely you’ll grab a little bit of everything and will be feeling too full later. Choose the foods you really love. It’s okay to be selective and yet, enjoy some of your favorite Ramadan foods. Going for the Second Slice of your Favorite Cake/Pizza/Chocolate etc. Always Include a serving of Salad or Fruit. Watch your PORTIONS. It’s all about portion control. You can eat whatever you like but in moderation. I love this simple tip by Katie Sheen on how to stop overeating. 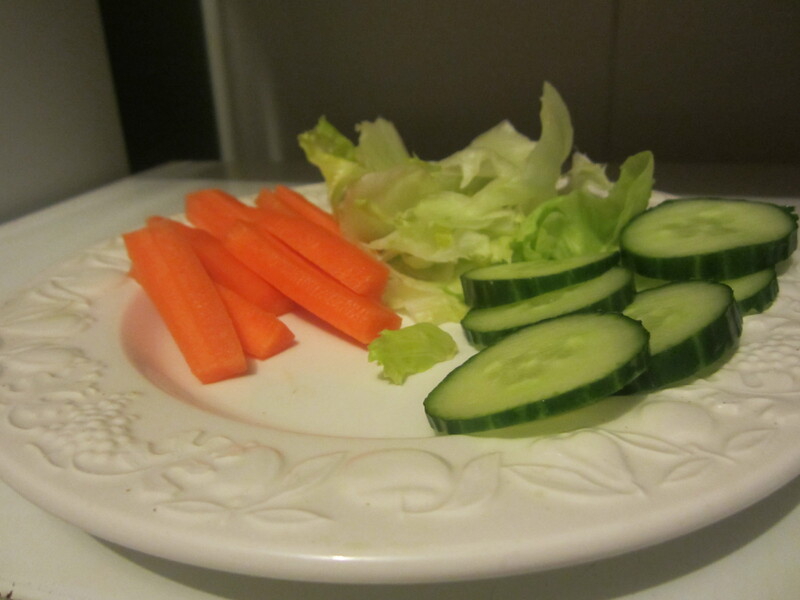 The trick is to include a serving of Salad with smaller portions of more indulgent and high-calorie choices. Go light on sauces and Dips – Instead go for Mint sauce or a serving of plain Yogurt or cucumber Raita. Balance Balance Balance- Your meal should contain carbs, fats and protein; if one or more is insufficient, you’ll feel hungry sooner. Incorporate vegetables and choose lighter cuts of meat such as turkey ,chicken breast, beef sirloin or fish. They keep you full without adding too much stress on your digestive system. My plate has Protein, Serving of Potatoes, and some veg. Poor Example. But the best I could find for time being. Golden Rule- Don’t hang around the buffet table. It isn’t easy to resist the delicious foods you find at Iftar, so get away. Make your plate and move to a different part of the room. Food within arms reach leads to mindless eating. I will be sharing tips in the next post on how to select your starter/main course/dessert mindfully. Sit Down and Focus- Never Ever Eat standing Up. Sit down and enjoy your meal so that eating nourishes your body and mind. Chew Chew Chew…. This is essential for Digestion. Eat Consciously and Enjoy Every Mouthful, put down your Fork in between Bites while you are chewing. This helps you resist the urge to swallow and move onto the next bite. Putting down your fork or spoon can really help slow down your eating. Why Stop and Chew, Stop and Chew? Making the decision to chew each mouthful makes binge eating nearly impossible. When you actually have to stop and chew your food until it’s soft, your brain will have a chance to catch up and send out the signal when it’s feeling full, or if it’s still hungry. When you finish your meal in 5 minutes, you’ll probably still be full and go back for seconds only to end up feeling very full half-hour later. In the nineteenth century, doctors recommended people chew each mouthful at least twenty times for optimal digestion. Say Alhamdulilah and move to your next bite. Going for Seconds? Pace yourself. Remember that it takes 15-20 minutes for your stomach to register when you are full. Go slow, savor your food and stop when you are full. Wait at least 20 minutes before going back for seconds. If you’re still hungry after eating slowly and chewing well then go back for seconds! Just chew them well. Remember: You are what you digest and absorb, not simply what you eat. You can keep from eating too much during the Ramadan. If you continue to eat a healthy and nutritious diet, you will feel better and have more energy to enjoy your prayers. Healthy Eating is when you feel good after you’ve eaten, you feel energetic enough to proceed with your night time prayers, and you’re meeting your body’s needs for fuel. When you think you are Full, Stop Eating. Limiting Intake of Sugary Drinks/Fizzy Drinks- Please Think Your Drink. My Golden Ramadan Tip: I always use Sea Green Granules- I sprinkle 1/2 tsp of Sea Food Granules on my Salad and often add a shot of Wheat Grass Synergy to my Drink. This Super Energizes my Evening. 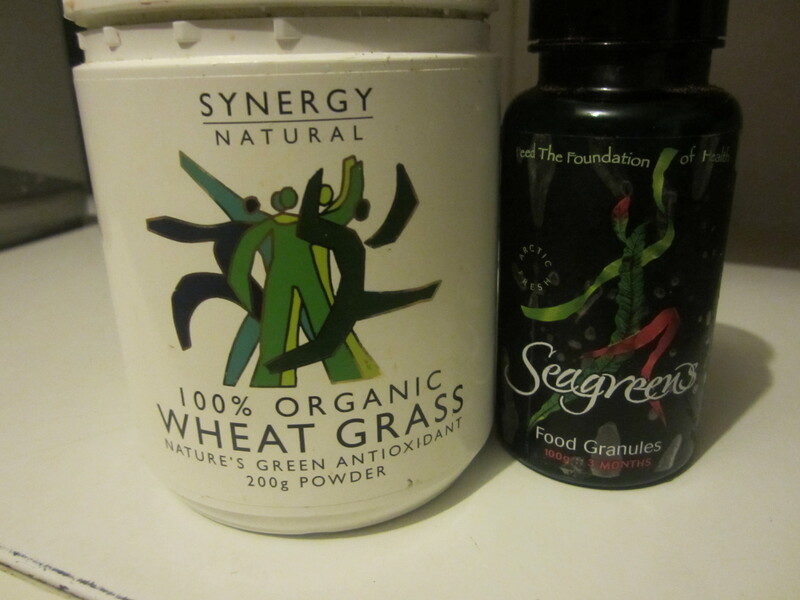 Wheat Grass provides all the vitamins, minerals, trace elements, enzymes, fibre and chlorophyll essential in our diet. Learning to Forgive Yourself- If you do slip up now and then, don’t beat yourself up for it because that’s what the demon of Eating Disorder wants you to do, reflect on your mistake, have a guilty conscious and ruminate and this will indeed impact your prayers and rest of the evening. Be good to yourself because you’re trying your best to defeat the demon of Eating Disorder. Hopefully by putting mindfulness into practice, it will stimulate you to become emotionally stronger and also to change your diet in positive and healthy ways. Inshallah by the end of Ramadan you will revolutionize your relationship with food and your self. Very Good Tips on Chewing and being Mindful. The article was really helpful. Ramadan is more than a month of fasting… It leads us more to a spiritual life. I really enjoy the happiness of Allah during this holy month of Ramadan. It is good to know like these to have a healthy spiritual Iftar Ramadan.